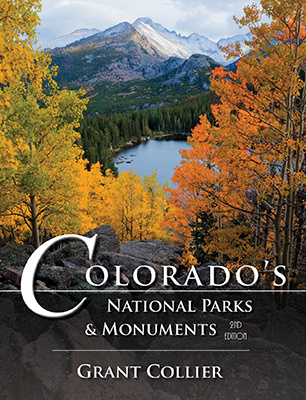 ﻿ Colorado's National Parks & Monuments, coffee table book. 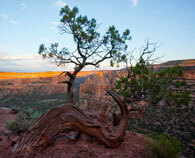 The national parks and monuments in Colorado harbor some of the most diverse and awe-inspiring scenery on the planet. They contain immense mountain peaks rising over 14,000 feet high, spectacular Anasazi ruins constructed 1,000 years ago, and deep canyons plunging 2,000 feet down to raging rivers. They also possess the tallest sand dunes in North America, immense sandstone rock formations rising over 500 feet high, and some of the largest petrified Sequoia trees in the world. Renowned photographer Grant Collier has spent several years exploring and photographing Colorado’s national parks and monuments. He has hiked in predawn light across Rocky Mountain National Park, driven over remote jeep trails in Canyons of the Ancients National Monument, and rafted nearly every mile of river within Dinosaur National Monument. In the process, he has produced the first comprehensive portrait of Colorado’s current system of national parks and monuments.